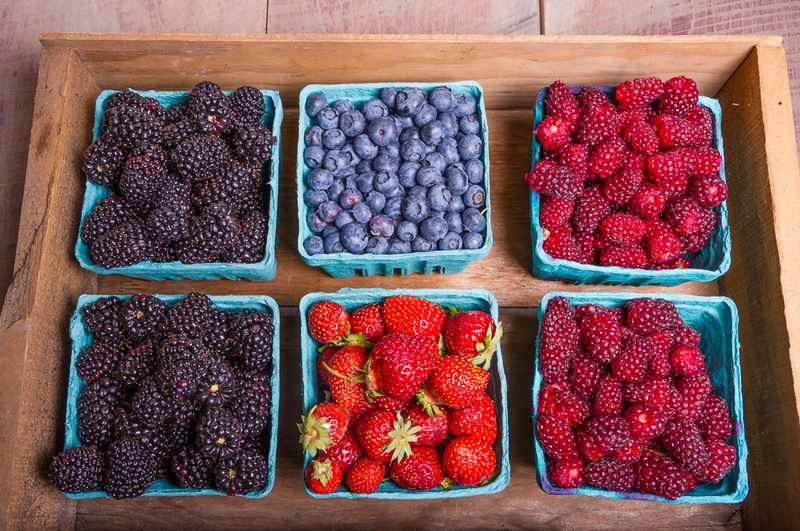 You know that summer has started here in Oregon when you see the boxes of berries overflowing at the farmers markets. Blackberries, Blueberries, Tayberries are in season with a few Strawberries still around. After gathering up several boxes of each of these berries I needed to find a way to enjoy all these berries in one day. 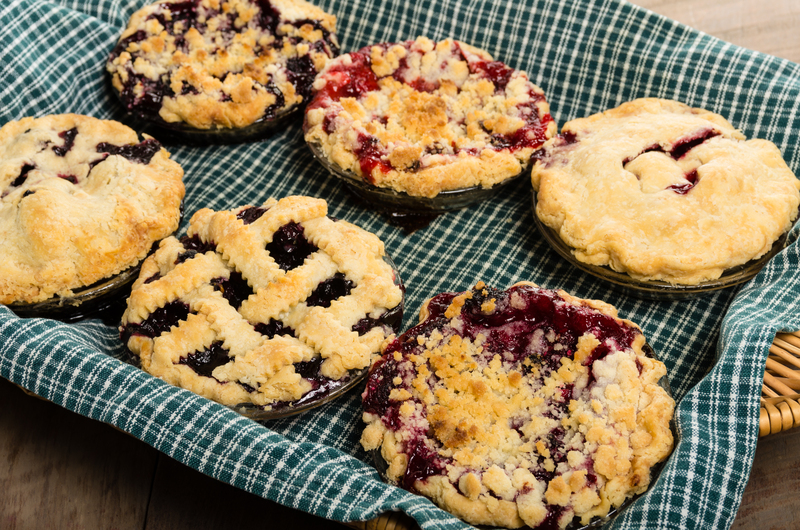 Mini pies are a great way to make small size treats so that you can sample several different flavors without a lot of baking. Blackberries and blueberries are both mixed with lemon zest and a dash of cinnamon to bring out their fresh berry taste. For the strawberries I mixed them with fresh chopped rhubarb and the tayberries are so sweet just a little sugar brings out their delicious flavor! The last thing on any pie is the topping. 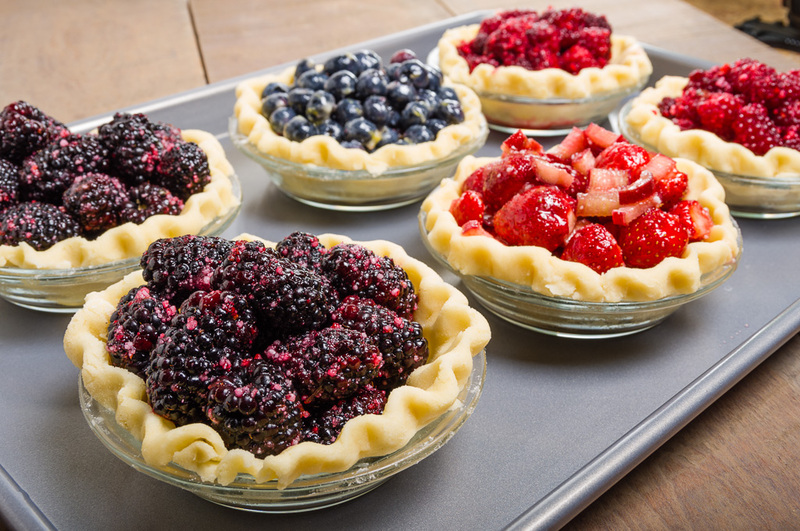 I made one each of the blackberry and tayberry with a traditional double crust. To show off the blueberries a lattice top was the best choice. Crumb top was a must for the strawberry rhubarb pie and the remaining berry’s pies. 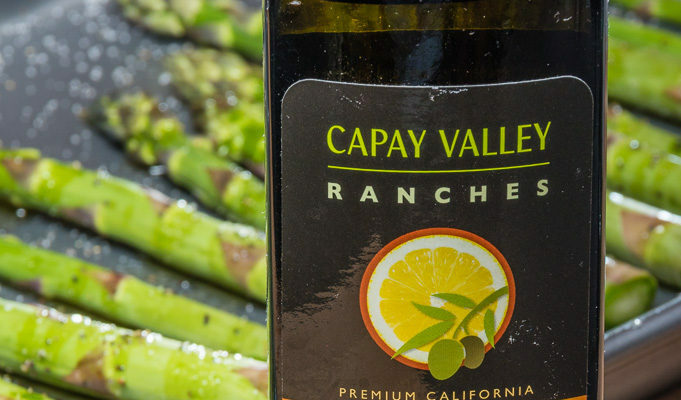 Enjoy the recipes below and make a Fresh From Oregon berry pie this summer. The recipes below will make 6 mini pies. If you want to make a full size of any of these pies below just triple the amounts of the filling and its perfect for a full size pie. In a large bowl mix flour and salt, add shortening and with a pastry blender mix just until the shortening is mixed and the dough is the size of small peas. In small bowl beat egg, vinegar and water with a fork, add to dough and mix until the dough just comes together (Do not over mix or the dough will be tough). 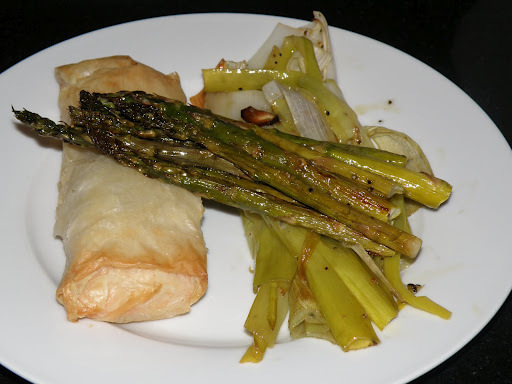 Divide dough into three pieces and flatten slightly, wrap in plastic wrap and refrigerate for at least 30 minutes. Once slightly chilled divide each dough into 3 pieces. 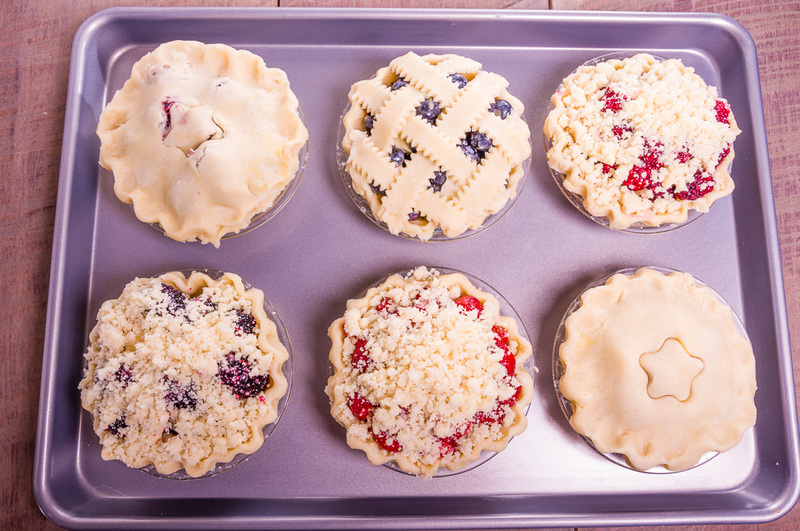 Roll out 6 pieces on a lightly floured surface and place into 6 mini pie pans. 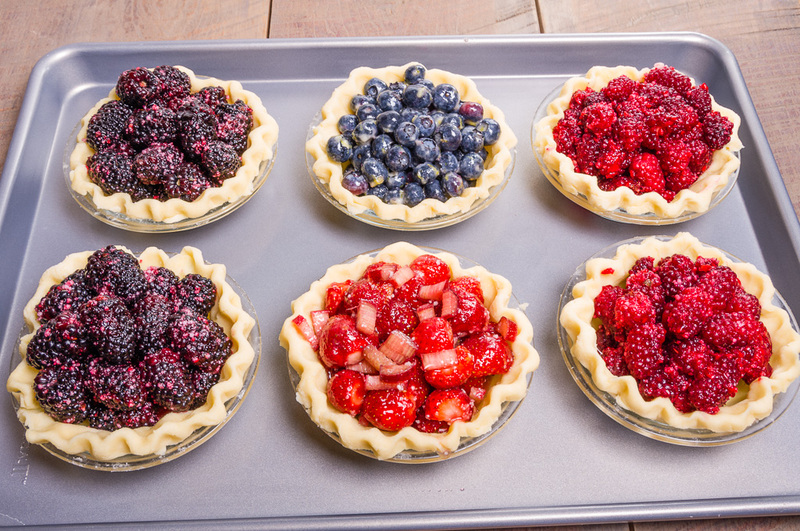 Roll out the remaining 3 pieces slightly bigger than the pie pan and set aside until ready to top one on the blackberry, tayberry and blueberry pies. 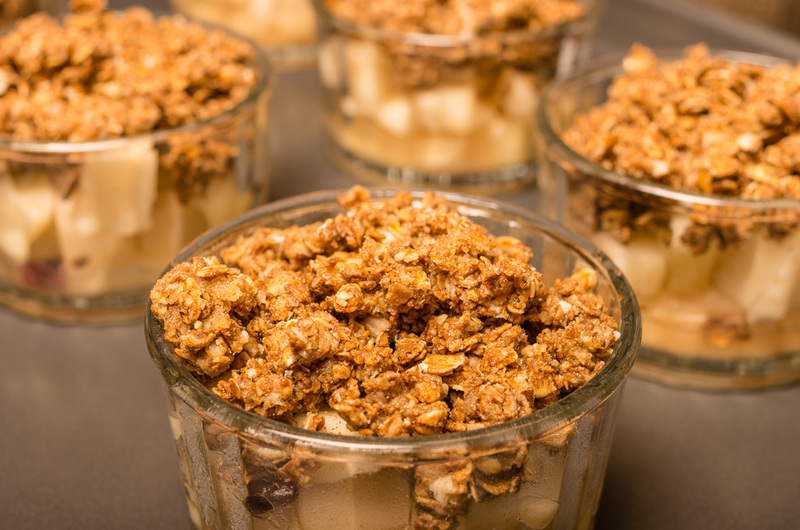 In medium size bowl mix 1/4 cup + 1 tablespoon sugar, 1/2 cup + 2 tablespoon flour and 1/4 cup of room temperature butter. 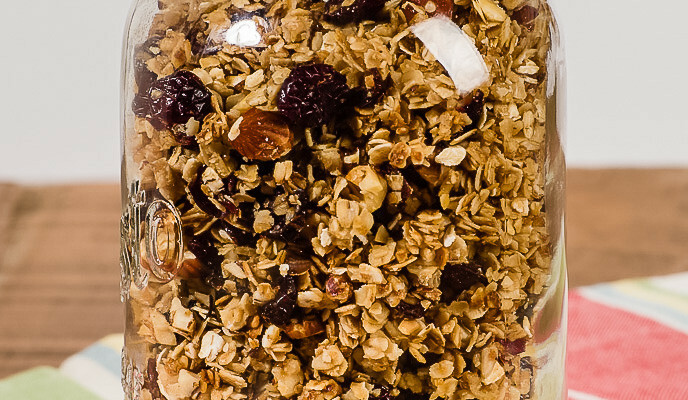 Mix until you get small crumbs, set aside. Place blackberries, sugar, lemon juice & zest, cinnamon and tapioca in a large bowl and toss gently to mix. Let set for 30 minutes. 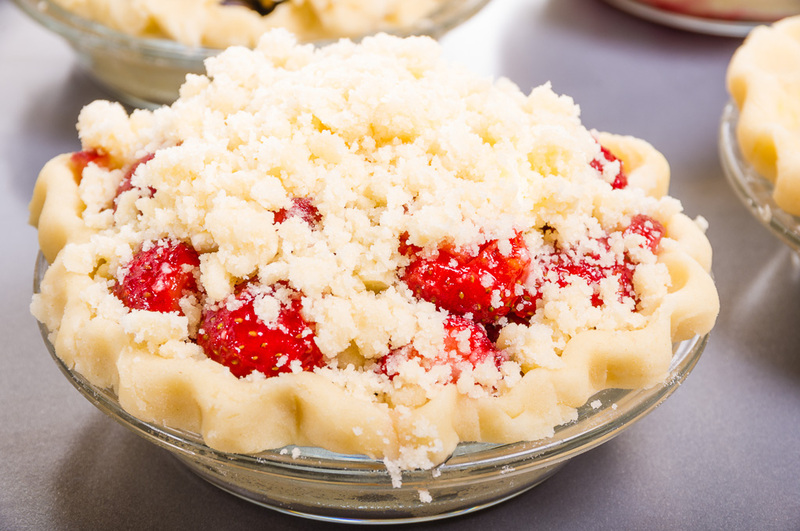 In one pie crust add 1/2 the pie mix place 1/2 tablespoon butter over berries and place one of the rolled out pie crusts on top. Roll edges under the bottom pie crust and crimp the edge. Cut a couple of slits in the top crust or use a decorative mini cookie cutter pressed in the top to create a vent for the pie. In the second pie crust add remaining berries and top with 1/3 of the crumb topping. Place on baking sheet. Follow the recipe above for the blackerry pie reducing the sugar to 1/8 cup and omitting the cinnamon. In small bowl combine blueberries, lemon zest & juice, flour, sugar and cinnamon. Place in one of the prepared pie crusts and top with the butter. Roll the edge of the pie crust under and crimp the edge. With the last rolled out pie crust cut strips of dough about 1/2″ wide and place on top of the blueberries in a lattice pattern. Place on baking sheet. In small bowl mix rhubarb, strawberries, sugar, tapioca, flour, lemon zest and juice and toss to combine. Place in remaining prepared pie crust top with butter and roll pie crust under and crimp the edge. Top with the remaining crumb topping and place on baking sheet. You are ready to bake your mini pies. Bake at 425 degrees for 15 minutes, decrease temperature to 350 degrees and baking another 45 minutes or until the tops are a golden brown and juices are bubbling from the pies. Remove from oven and cool on wire rack. How big are those mini pie plates? They look like glass custard size? Not only beautiful pies but how yummmmmmmmy they must be!!!! Carrie, what are tayberries? Do they taste like anything else for a comparison?